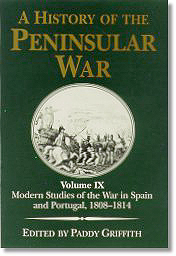 Without a doubt, the most comprehensive study of the Peninsular War was Sir Charles Oman's A History of the Peninsular War. Although written at the beginning of this century, its seven volumes covered the seven years of the struggle in such great detail that it has defied all attempts to replace it. Although still considered by most to be the definitive work on the Peninsula, new sources and analyses have led some modern scholars to question parts of it. With this in mind, Greenhill Books has recently published a companion volume to the History. In this volume leading authorities on the Peninsular War examine different aspects of the study and, in the words of the editor, reassess "Oman's contribution in the light of the modern scholarship, while also explaining something of their own new findings about these subjects. Taken as a whole, our book seeks to direct the interested reader towards features of the Peninsular War which may be new, or unfamiliar, or which are simply 'not in Oman.' Hence we will be supplementing him, rather than supplanting him." The authors of the various papers may at times appear to be very critical of Oman, yet this is not because they find great fault with his work, but because "... our disagreements with him tend to need many more words of explanation than do our agreements." Paddy Griffith has assembled an impressive number of essays by some of the biggest names in the field. In the book Philip Haythornthwaite compares the British army under both Sir John Moore and the Duke of Wellington, plus providing overviews of the numerous sieges that were conducted by all sides. Rene Chartrand re-evaluates the role of the guerrillas in the War and how he believes Oman under-estimated their impact. Along with an extensive listing of the various guerrilla bands and their strengths, Chartrand provides numerous contemporary descriptions and reports on them! For those familiar with Oman's ground breaking and controversial essay on "Line versus Column," there is Brent Nosworthy's piece on the subject. Volume IX takes a closer look at Wellington's allies than Oman did. There are chapters on the both the Spanish and Portuguese contributions to the effort. From the other side, there are articles on the French army by James Arnold and the Bonaparte Kingdom of Spain by Ambassador Leopoldo Stampa, which examines why King Joseph's reign was doomed form the very beginning. Of particular interest to me, was the essay by Dr. Rory Muir, which provides great detail on British foreign policy and its impact on the War, an area that was not covered in much depth by Oman. Dr. Griffith also contributes to the volume, including a short biography of Sir Charles Oman and an analysis of Oman's perspective (or lack of perspective) on the operational art of war. He closes with a description of the state of the various Peninsula battlefields and with a bibliographic essay that will be very useful for those wishing to do their own research. Volume IX will be of great interest to those who specialize in the Peninsular War and who want to expand their horizon beyond what Oman offers. They will find new material and at times may strongly disagree with the conclusions of the writer. What they will not be, however, is bored!